Please look here to see some places where Project Indigo has been featured. I hope that one day I will be featured in Doctor Who Magazine! If you see Project Indigo featured anywhere else please get in touch and let me know. You can read my 3 top-tips for starting a blog in the Winter 2015 issue of City Kids Magazine. On 5th November 2015, Nick Grimshaw interviewed Peter Capaldi on the Radio 1 Breakfast Show. I tweeted in a question and Peter answered it! Listen to the interview here, my question is at 54:30. Peter Capaldi on the Radio 1 Breakfast Show with Nick Grimshaw. In October 2015 Team Locals for Portsmouth and Southsea wrote a feature about my trip to No Man’s Fort in the Solent. You can read it here. 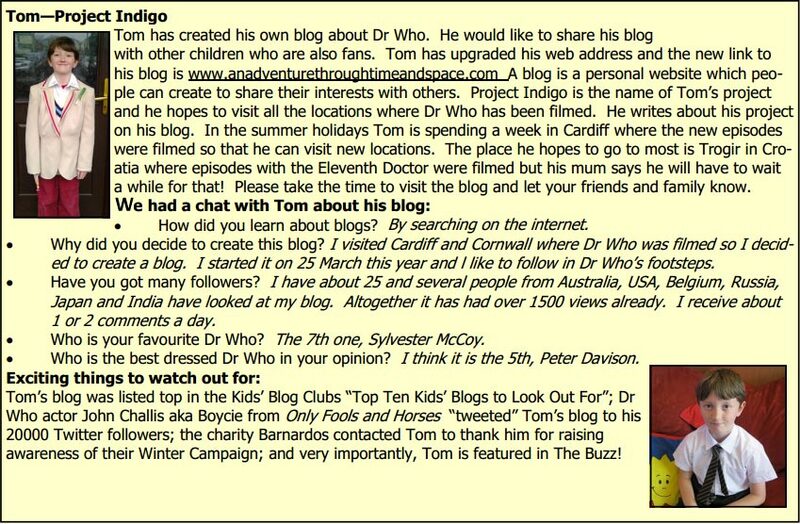 10 year old Doctor Who blogger will visit No Man’s Land as part of location tour. In August 2015 I interviewed Classic Doctor Who star Katy Manning with Doctor Squee from the Gallifrey Stands Podcast. Please listen to the Podcast here, the interview starts at around 30 minutes into the show. 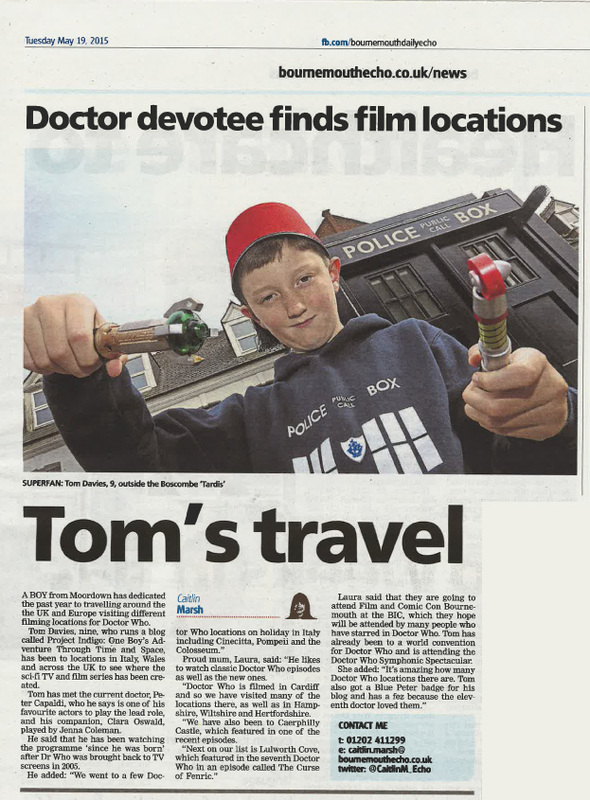 On May 19th 2015 I was featured on page 3 of the Bournemouth Echo and on the website, please view it online here- Tom’s Travels or click on the article below to read it. In April 2015, Lynn Schreiber, the editor of Jump! Mag, used Project Indigo to help demonstrate how Social Media can help boost kids’ confidence. You can read her article here – Artemis Mindset Coaching. The team at Who Wars invited me to answer the question Star Wars or Doctor Who? It was an honour! You can listen to my interview which was released in February 2015, it starts at 80 minutes into the podcast. I had my first article published in local magazine The Local Eye in February 2015. This magazine is delivered to over 12,000 homes and businesses! Please click on it to read it. 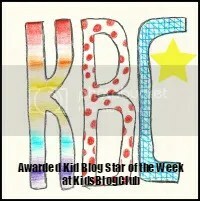 In January 2015 I became the first ever Kid Blog Star of the Week of Kids’ Blog Club ! That was epic! I was a finalist in the MAD Blog Awards Kid Blog of the Year 2014 – which felt great! Here is a list of all the finalists. I was interviewed for thisisFoxx’s Youtube channel on the day I met the Doctor! View it here Doctor Who Crash Lands in London. My first TV appearance! Blue Peter showed Project Indigo in their 12th Doctor Special, first broadcast on Thursday 21st August 2014. 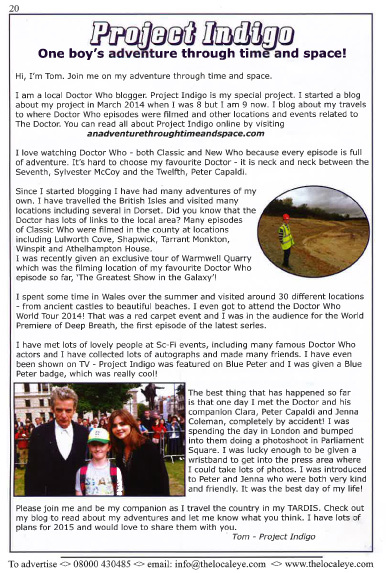 Here is my first ever interview – for my school magazine! Please click on it to read it. I first made the Whoogle Weekly Round-Up with my review of ‘Life and Death in Doctor Who’ at Bournemouth University and I’ve been included many times since. There will more to add I hope!